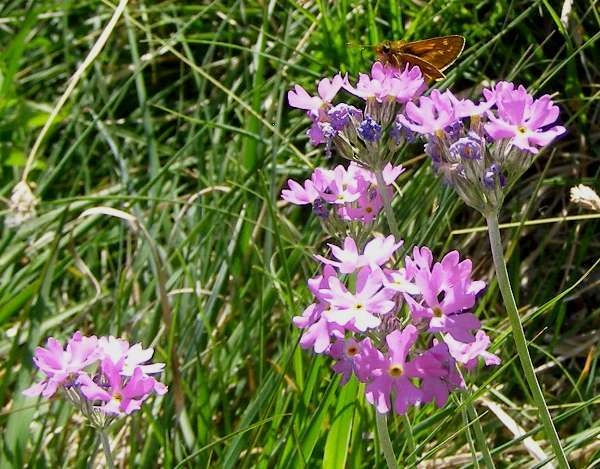 Rare, delicate and very beautiful, the Bird's-eye Primrose is threatened in many countries by habitat destruction and environmental pollution. Bird's-eye Primrose is a perennial Arctic-alpine plant growing to a height of about 25cm. From a basal rosette of narrow oval short-stalked leaves, smooth on top and powdery below, grey-green powdery stems arise bearing clusters of typically 10 - 20 mauve flowers. Individual flowers 8-16mm across have five-lobed corollas, each lobe with a sharp notch; there is a yellow central 'eye' with five stamens. 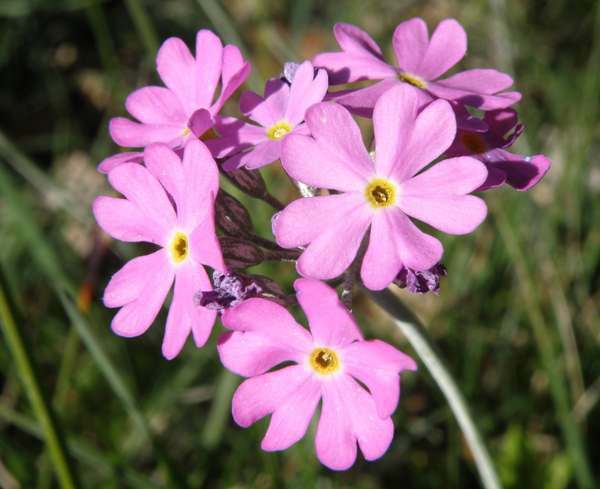 This pretty, pink member of the Primrose family occurs in the northern part of Britain. It is localised and becoming increasingly rare due to the destruction of its habitat. Bird's-eye Primrose is more common in the countries of northern and mountainous parts of central Europe, including Slovenia where there are Common Primrose and Oxlip, too. 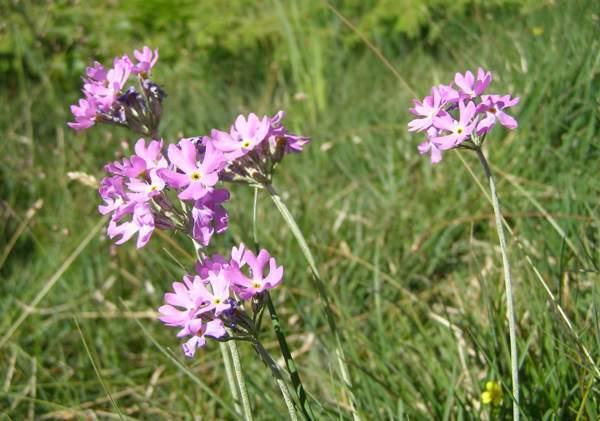 Bird's-eye Primrose favours damp, relatively short grassland with a calcareous substrate. The margins of fens on limestone substrates are crucial and very scarce habitats. In Britain Primula farinosa blooms in June and July. This lovely wildflower is an endangered species in many parts of its natural range; however, cultivated forms are still popular as plants for parks and gardens. Skipper butterflies seem to love the flowers (left). The generic name Primula comes from the Latin Prima, meaning first - a reference to the early appearance of flowers in this genus and Primroses in particular. It is from Latin that we get the specific epithet farinosa, meaning floury or powdery and refers to the floury surface of the flower stalks. The common name comes from the yellow 'eye' in the centre of each flower, and this name is variously written as Bird's-eye Primrose, Bird'seye Primrose, or Birdseye Primrose. Cowslips Primula veris and Primroses Primula vulgaris are close relatives, but their flowers are usually yellow and not likely to be mistaken for Bird's-eye Primrose; however, Primrose Primula vulgaris does have a mauve form that can be distinguished from Primula farinosa because its flowers are on borne singly on many individual stalks.. The Bird's-eye Primroses shown on this page where photographed at Gait Barrows National Nature Reserve in Lancashire in mid-June.